"So how come you never did a thing about Pat's chili dogs? Thought you liked stuff like that." "We do. Maybe we will." "Oh. Okay. Like now now or now later?" 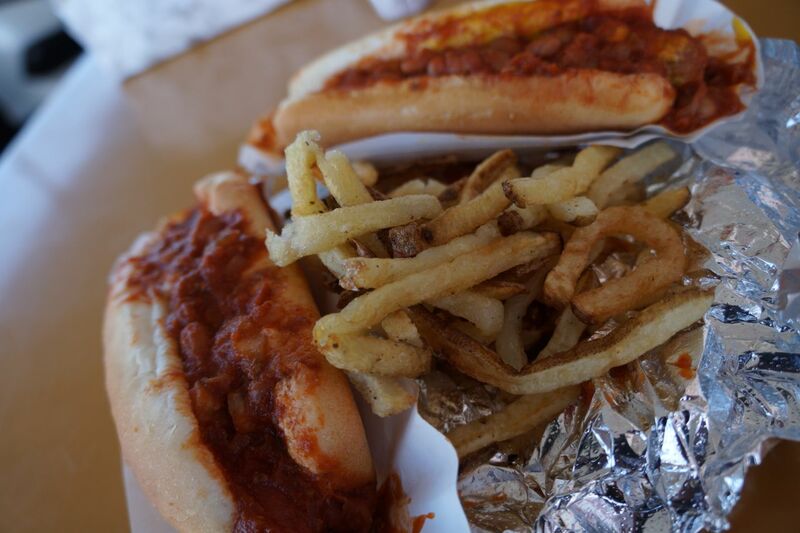 Pat's Drive In (or more commonly known as Pat's chili dogs) has been serving up sloppy awesome since 1955. 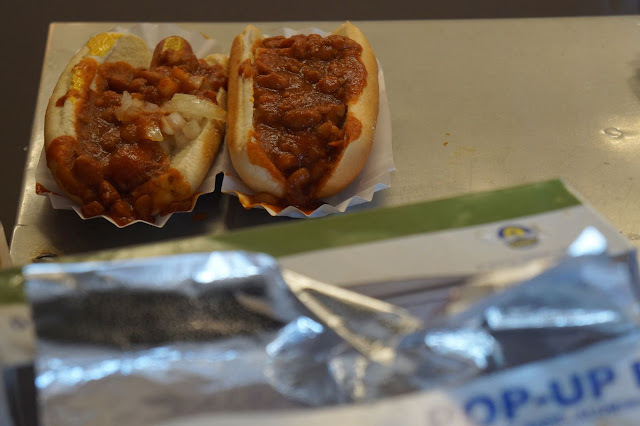 Founded by a guy named Henry Patterson, (or more commonly referred to as Pat), this little fast food stand has stood the test of time, waistlines, dedicated fans, an obscene amount of criticism and above all the question of what makes a "real" chili dog. 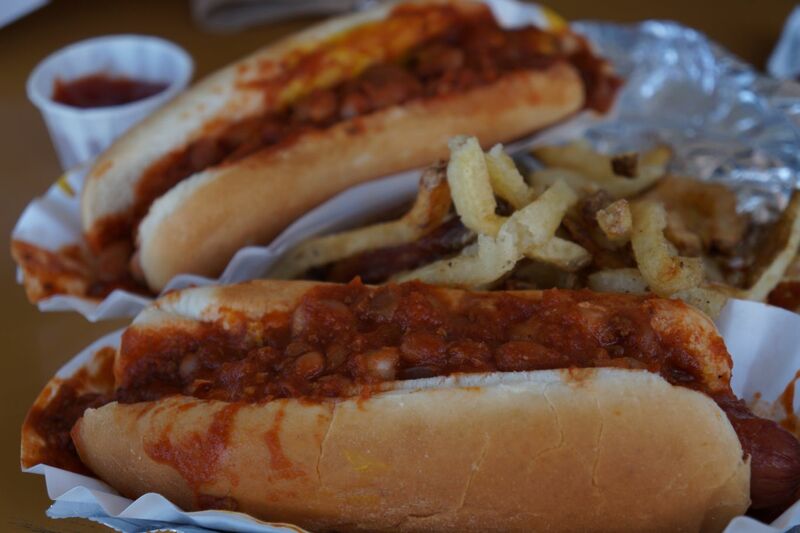 Do you put beans in your chili for a chili dog or just meat? Let the great debate begin! 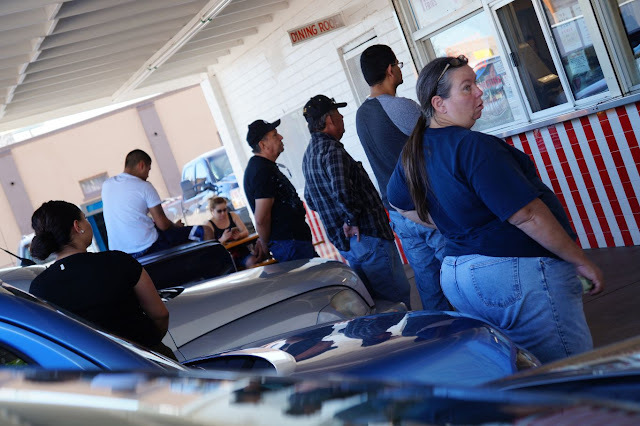 According to local legend, the recipe for their "famous" chili has changed over the years, which has upset a lot of regular customers that have been coming here for decades. Others deny this. Insiders stake that the recipe hasn't switched at all since its inception, but rather perhaps whoever was on chili prep that day might have added too little cumin, or too much paprika...stuff like that. Which can happen. And it does happen. Having been here only a handful of times, we have never noticed a change in the chili recipe. The recipe itself? No actually the links they use at Pat's are a nice quality; soft and flavorful that nestle well with the steamed buns that surround the slapdash fillings. All for like $2. C'mon now. Now that's a win all around. Observing the controlled chaos that goes about inside during a rush is a thing to marvel at. Each employee has a specific station and if they deviate from that said assignment...pure anarchy. It's a bit like watching a line of ants get scuffled by a falling leaf that got in their way. Sure they press on and eventually get proper order reinstated, but for a few minutes a good scream is to be heard, blame gets tossed around like a game of Hot Potato, someone nearly quits and no one knows what do to for a few seconds. It's quite the spectacle if you ask us. But once structure falls back into place, all is right with the world. That's why we think the cooks and servers there are so grouchy, or ornery is a better term: Constant movement, not getting rich doing this and Carl showed up late again. It's always Carl isn't it? Shouldn't that be Weeniecat Country? Our first experience with Pat's was a couple of years ago. And it was sort of on a dare. It was early July, hot, had the day off and we were reeling that Joey Chestnut usurped Takeru Kobayashi for eating the most hot dogs. 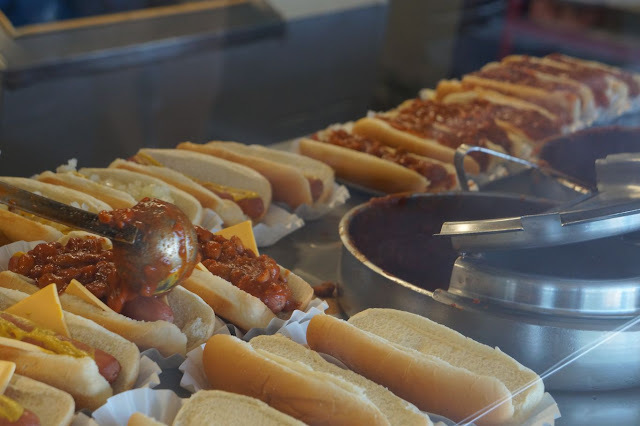 Influenced by that bout, we set off to find this Pat's place and see how many dogs we could stuff in our beer soaked faces thinking that we could challenge Chestnut's 66 hot dogs in ten minutes. Kobayashi only ate 63. Yeah..."only". Got about three in before hitting the weenie wall. Fries were involved too, but still. Only three. The chili dogs themselves aren't very big which made us wonder why we could only put away three. "Remember that bar-b-que we were at earlier? ", noted one of our 4th of July reveler friends. "You had like four hamburgers." Oh yeah. We did eat a lot before coming to Pat's. Huh. That explains it. For all of our smarts, we sure am dumb. The dogs were good though. But the fries! Oh man...the fries are what kill it for us. Hand cut, thinly sliced and perfectly greasy fries are the ideal accompaniment to their dogs and burgers. The old school fry trough looks as if it hasn't changed since the Kennedy administration and we are sure that's what gives the side treat their sheen and moxie. 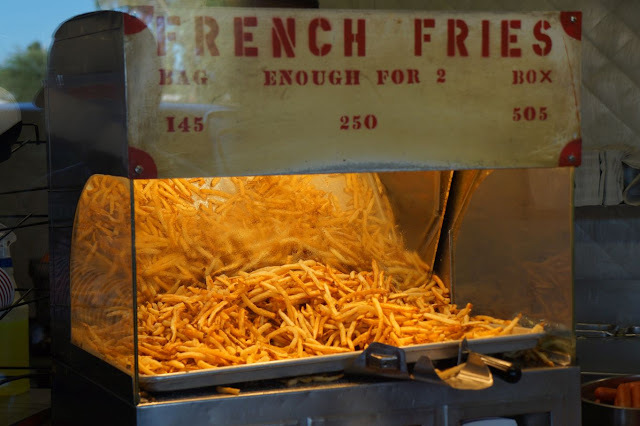 Hot, chewy, reminiscent of a state fair or circus, the fries at Pat's are some of the best in town and that is a throw down we will stand behind. Many chefs here in Tucson take the fry game to a whole new stratosphere, but there is something about a lil' stand that's been standing around for over 50 years offering up classically cooked fries served in a white sack that turns a deep silver from the amount of grease emanating from them. You may think 'gross' but you know you want some right now. Located on the corner of North Grande Avenue and West Niagara, in the Barrio Hollywood district, Pat's isn't exactly in the most picturesque of locations. We don't care. We love this part of town. 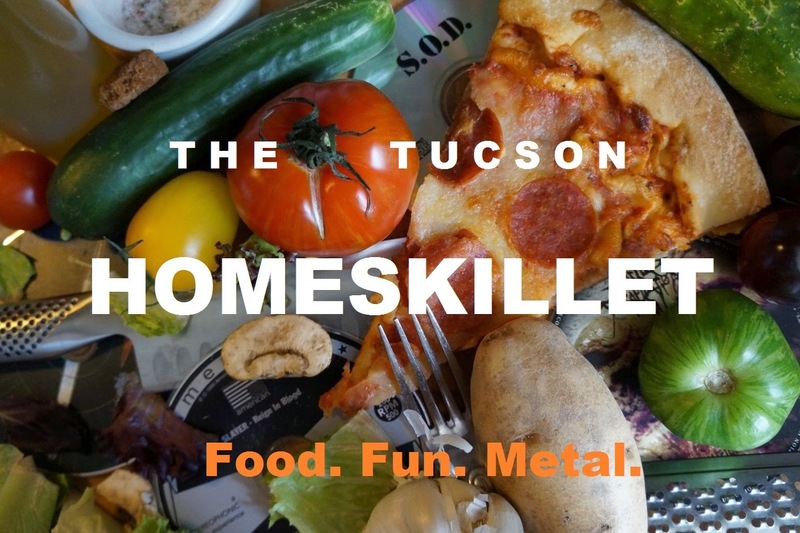 Heck, Taco Giro and Tania's 33 are just down the block, some of the best food around, but a lot of timid tourists looking for a taste of old timey Tucson or so called "foodies" that are on the prowl for that next funky and "totally hilarious" grub spot might get thrown off a bit. This particular stretch of Tucson is a little rough, kinda run down, very blue collar and very barrio Tucson. If you go online and read some of the "complaints" about Pat's, most will be about the conditions of the neighborhood, the cleanliness of the tables outside (you gotta buss that stuff yourself pal, kids inside are too busy to wipe down benches making it all "safe" for you to eat their deep fried majesty) or the attitudes of the staff. "Ugh. So rude," one 'critic' had to say about the employees. "Like he didn't even say thank you. Just took my money like an animal. I think they're all like gang members or something." Probably. I hope so. 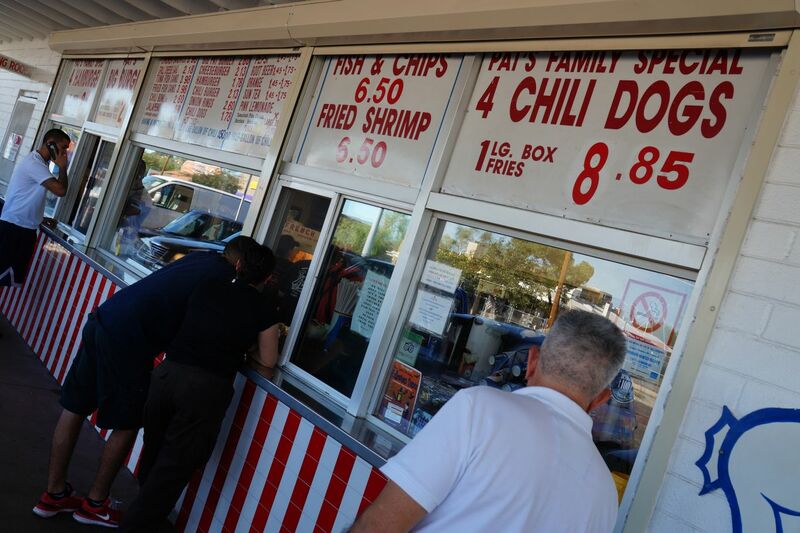 Better them cooking us up some chili dog madness then being out on the street getting into mischief. Pat's is definitely a "locals only" type of place or for those that are cool enough to just relax, sit back, go to your happy place and eat some burgers and dogs from a drive-in for just a couple of bucks. Otherwise, good luck finding these prices and this kind of atmosphere in the Foothills. Aint gonna happen. "Where's my chili dog at?" 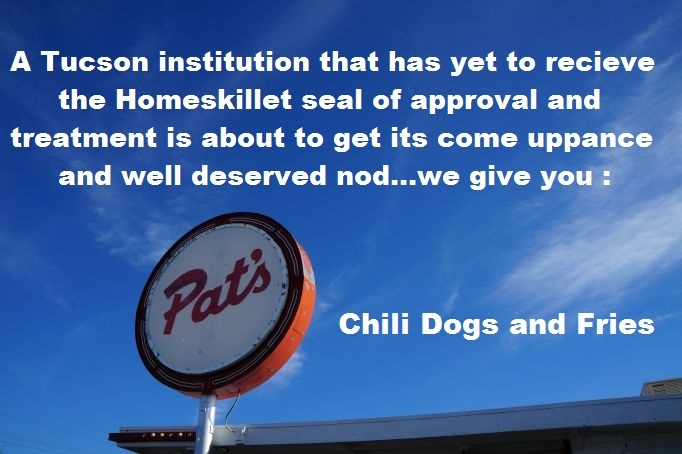 With that said we at the Tucson Homeskillet just want to thank Pat's for doing what they do, why they do it and how they've been doing it for so long. We love tradition and are glad that they have kept to their food heritage for this long. We have a feeling they will be around for many more years to come. By the amount of business they do on a regular basis is an attest to that. 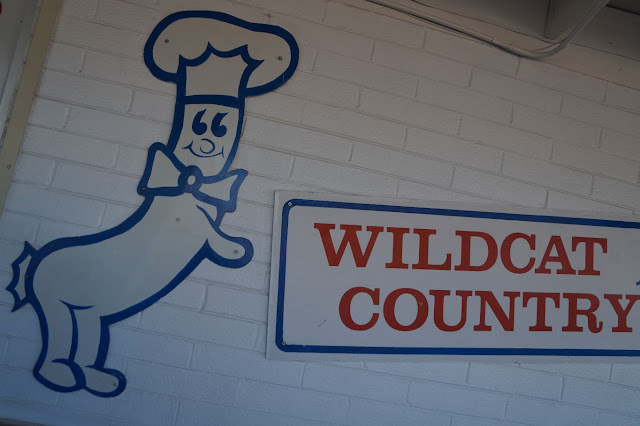 It's also nice to know that when you just want to have a taste of your childhood or maybe that one time when you took your date here and things went pretty well because now you're married and all that, Pat's is that place. No fuss, a bit of a mess, this walk up drive in is an institution whether you like it or not. Sorry. Don't wanna mess with tradition.